If you’re a history buff, looking for creative inspiration during hard times, or happen to be bored in Paris, there is an exhibit going on now at the Mémorial du Marechal Leclerc de Hauteclocque et de la Libération de Paris – Musée Jean Moulin, twin museums dedicated to the French Resistance and Liberation of Paris. The exhibit shows a vast collection of fashions and accessories from the era, and runs through Nov. 15, 2009. You can see first hand examples of how Parisians were using whatever materials they had available in order to maintain there forward-thinking edge in fashion. I personally think this exhibit represents a duality in Paris, at a time when haute couture could not be made due to market and supply shortages, and where Paris was itself isolated from the global audience. Here you can see how everyday-people in Occupied Paris incorporated radical and creative pieces into their daily wardrobes, demonstrating the early ingredients of a culture that would take France beyond the couturiers of the French Court of Louis XIV, and into the modern spotlight of high-fashion after the war. Recovery of the fashion industry was not easy in France after WW2. The geography of fashion has distant roots, and world capitals rely on a large accumulation of materials from around the world. As a Nazi-occupied island, isolated from the rest of the world, Paris lost their monopoly on fashion, with competition growing stronger in New York, London and Italy. In order to recover, French ateliers returned to the haute-couture stage, but with innovative cooperation between the fashion and textile industries. The Theatre de la Mode was a traveling exhibition of more than 150 wire-frame dolls, each about 70cm tall, dressed in miniature couture clothing (see photo, above). These small sizes were used to save on expensive materials, while still demonstrating the tangible qualities of the garments’ designs and construction. More than 50 French couture houses participated in the exhibition. In 1946, Christian Dior (1905-1957) came on the scene, opening his own couture house. He was contacted by the French Minister of Fashion (what a title! ), a man named Lucien Lelong, and asked to partner with French textile tycoon, “The Cotton King” Marcel Boussac, in order to reinvigorate the fashion and textile industries of France on a global scale. Jacques c, a young civil servant, was hired to serve as business administrator. Dior launched his first collection in 1947 in cooperation with Boussac. The collection embraced the “New Look”, which recalled the formerly popular S-shaped silhouette without the underlying cage. Dior abandoned the masculine look, and emphasized luxury and opulence. The look was indeed new after years of the plain, shapeless ration dresses of WW2, and came with huge amounts of layered textiles and embroideries. Dior and Boussac used their marketing skills to promote the extensive use of fabrics (promoting the textile industry) and opulent details and construction (promoting the fashion industry) by playing to the optimism that followed years of suffering. Over time, Rouët worked to extend the brand into a range of licensed items, exploiting the financial rewards of export deals and licensing contracts. Dior understood and exploited the promotional value of press coverage, and frequently made headlines while catering to Hollywood’s best and brightest, and by giving headline-generating names to each of his collections. For a more in-depth look at the life and work of Dior, check out his biography at the Design Museum site. As far as fashion in concerned, WW1 produced a strong discontinuity in the way women dressed (of course, the men were wearing uniforms). The increasing employment of women in industrial activities had relaxed strict dress codes, and allowed women to wear cotton trousers for the first time. As women’s roles in Western society changed, modern fashion changed along with it. Paul Poiret’s extravagantly-modelled business failed after WW1 erupted, as a result of his failure to understand the evolutionary landmark of the War and it’s impact on society and fashion. He failed to adapt to meet the modern needs of his clients, thus opening up a market for Coco Chanel. Easy-to-wear clothing had diffused into mainstream society, and the use of “poor” materials proliferated. (Wool was necessary for uniforms and interwar unemployment created a further need for substitute and recycled materials.) Garbielle Chanel best exemplified the discontinuities in fashion, brought on by WW1. Chanel began work in the major garrison town of Deauville, where she met an officer who provided the capital for her to start her own millinery. 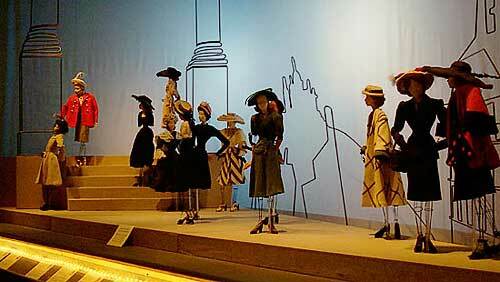 Chanel believed that a woman could be active and still remain elegant. She put this philosophy into her designs, shortening skirts and using jersey in womenswear. Of course, jersey had previously only been used for men’s underwear and sportswear, so this was considered revolutionary at the time. Her dresses stressed the new social role played by women, incorporating simplicity and masculinity. Chanel was among the first to validate the fashionable qualities of black, exemplified in her little black dress (beginning in the late 1930s). She felt that for daywear and eveningwear alike, that is was unnecessary to dress in a very opulent way. In terms of a business model, Chanel ran the house and created the designs, but had her vendeuse in the shops for customer assistance. Assemblers were separated into workrooms by the piece of apparel or accessories being constructed, and further by function (weaving, embroidering, etc.). The work was seasonal and the company was completely hierarchical. Chanel began diversification of her brand through the production of perfumes and jewels. In the 1930s, the constructed pins made from stained glass. Chanel was the first designer to place great importance on bijoux. She maintained one symbol from her past among “doubtful” women- the camellia, trademark flower of high class prostitutes. She turned this symbol into a luxury accessory. Jewelry was an important decorative element upon the simple, clean Chanel dress. She launched Chanel No. 5 for her 40th birthday in 1921, named so because it was the fifth perfume trial. However, this was developed in the days before licensing. Chanel accepted only 10% of the Parfum Chanel stock without royalty, and was only granted 2% sales royalty in 1947 by Pierre Wertheimer, owner of the manufacturing company. The unique bottle design of Chanel No. 5 was very simple, geometrical and linear, demonstrating the “essential” nature of the fragrance. Furthermore, it carried a simple, easy-to-remember name. Its scent was the first not to use a natural fragrance, but to incorporate an artificial one derived in a chemist’s laboratory. Chanel used her own name in all matters, on all products and campaigns. With No. 5, she was selling her look and lifestyle, and therefore her branded self. This branded marketing was so effective that Chanel No. 5 remains one of the top-selling perfumes today. (The company estimates that one bottle is sold every 55 seconds.) However, the next time you are at the perfume counter with a friend, try a blind sniff test putting No. 5 up against a more modern fragrance, like Chanel’s Mademoiselle. These days, 99% of the time, No. 5 will not be appreciated unless the person smelling it knows that it is Chanel’s classic fragrance. It’s nothing against the fragrance- it’s just a bit outdated for our modern noses, and a little heavier than what most consumers today are after. Yet it flies off the shelves. That is some serious brand power! By the second half of the century, Chanel was making more money in accessories and perfume than in apparel itself. Chanel stopped her business during WW2 and immediately after, due to market shortage, supply shortage and her public affair with a Nazi officer. She finally came back in the 1960s with her infamous suit, which was confident and comfortable, and represented a counterplay to the New Look by Christian Dior.